I have always been a fan of business simulation games, both on Mac/PC and on the iOS platform. Most of the games in this genre are designed for teenagers or more mature audience. It is quite rare that we see a business simulation game designed for juniors ages 7+. 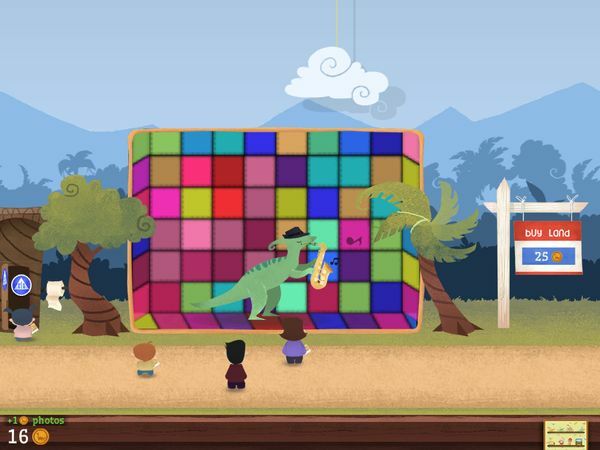 My app pick for today is Dinorama, a game that lets juniors build their own dinosaur park and learn how to run their own businesses. They will learn about the basics of running a business, improving, expanding, and making the most profits out of it. You start the game with enough money to buy a dinosaur and feed it once, which should buy you enough time to start earning money from entry tickets. After a period of time, the health of your dinosaur will decrease. That is when you need to feed him again before he falls sick and be forced to leave your park. There are plenty of ways in which you can spend your money. You can buy more dinosaurs, give them fancy treats, decorate their habitats, or build other things to enrich your park. By nature, you will want to find ways to generate more revenue that will allow you to maintain your dinosaurs and improve your park. 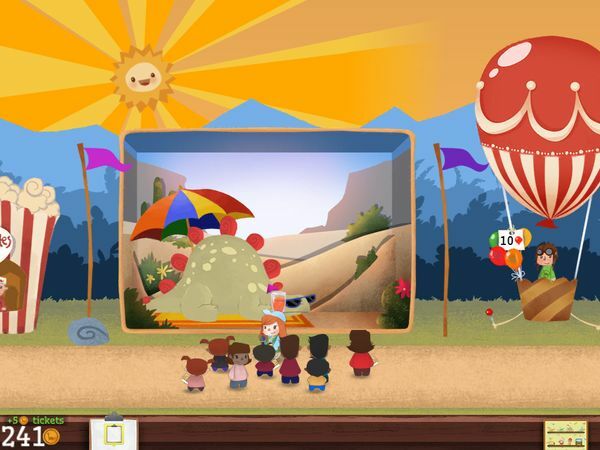 Dinorama allows you to build a photo booth, popcorn stand, balloon stand, and gift shop. All of these merchandise outlets will generate revenue and profit over time. All you need to do is pay the upfront cost to set them up and restock them with goods if they run out. While the merchandise outlets are good for generating profits over time, they are not your primary sources of revenue. The amount of money you get from entry ticket sales is much greater than those of merchandise sales. Therefore, you will naturally want to increase the total entry tickets revenue. There are two ways to do this: increase the number of visitors and increase the entry ticket bonus. Generally, increasing both at the same time is even better. To increase the visitors, you need to buy more expensive dinosaurs as they attract more visitors compared to the less expensive ones which are available in the early stage of the game. As you progress through the game, you can collect stickers and use them to unlock more dinosaurs and other items to purchase. Even though you can’t increase the entry ticket price, you can get additional random bonuses when a new visitor comes to the park. To trigger such bonus, you can decorate the dinosaurs’ habitats to make them more attractive. Throughout the game, you would also encounter side quests such as taking the visitors to see their favorite dinosaurs, meeting other visitors, or finding items that visitors lost in the park. Each time you complete such quest, you would get stickers and/or money. Dinorama is a business simulation game designed to teach juniors ages 7+ about the basics of money and time management. At a later stage in the game, you can start depositing some of your cash in the bank. The more that you deposit and the longer that you leave them untouched, the more returns you will get. Unlike other simulation games where time and money are critical resources, Dinorama doesn’t rush you in. You play according to your own pace. It does not offer any in-app purchases that can let you cheat your progress in the game. As expected of a business simulating game, Dinorama is a game of decision making. It’s a perfect way to teach your juniors about their first important entrepreneurial lessons, such as saving enough cash for stormy days and food price spikes, and purchasing as many items as possible to reduce their unit price. The game also trains them to prioritize, especially when making purchases. Which one would you choose first? Would you increase your visitors first, increase the ticket bonus, or reduce your maintenance costs? As the game progresses, it can seem a bit busy. But, you don’t need to tap on all the coins and stickers to collect them. The game will automatically collect them for you after a period of time. There is also no time pressure in completing the side quests, either. Nonetheless, the game is really addictive. I simply can’t stop playing it. Restock your merchandise outlets with the highest option whenever possible. Pay attention to your cash flow, and compare them to how fast the stocks are depleting. Withholding your other purchases to time your restock purchase will prove significant in the long run. As soon as you can start depositing some cash in the bank, always go for the largest amount of savings. When it’s time to earn the returns, simply put back the same amount of savings, and keep the interests. That way it can become a never-ending money machine that puts out a fixed amount of interest over a certain period of time. Whenever possible, improve the habitats of your dinosaurs in such a way that would increase the entry ticket bonus as early as possible. You probably should prioritize it over buying a new land to expand your park. You should only expand your park when you have enough cash to immediately build something on it. Otherwise, it’s probably better to invest your cash in things that could bring you more cash in a shorter cycle. Dinorama is a really great and fun business simulation game designed for juniors ages 7+. It highlights all the great aspects from a simulation game, such as time, money, resources, and attention management, without being overly complicated for its intended audience. It’s a perfect environment to let your juniors practice their entrepreneurship skills in a safe environment. I really enjoyed playing this game, and I’m sure many juniors and their parents would too.